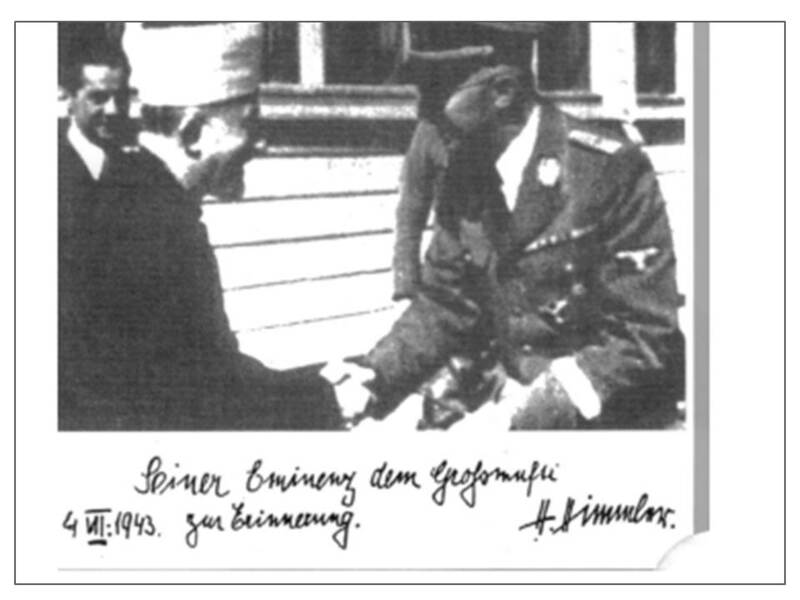 Published a month after the notorious Hebron massacre and the subsequent Arab violence, which left 133 Jews dead, the article is entitled “‘My Hands Are Clean,’ Grand Mufti Asserts in Interview;” and as the title suggests, it describes an interview with Haj Amin al-Husseini, who had incited the violence with the pernicious (and still popular) libel that “the Zionists” were plotting to damage or destroy the Al-Aqsa mosque in order to rebuild the Jewish Temple. The mufti also said some other things that you can read any day at Ali Abunimah’s Electronic Intifada and similar sites: he complained about “the aid of rich American Jews for the Palestine upbuilding” and claimed that this aid “made the Palestine Jews so arrogant, they thought they could start expelling is [us].” And just like Palestinian leaders nowadays, al-Husseini denied having incited the murderous violence. As it happens, when I researched this post, I came across another fascinating article about al-Husseini from June 1948. At first, I was not sure if the site that featured it, i.e. Old Magazine Articles, could be trusted. The article is entitled “Hitler of the Holy Land” and the sub header describes the mufti as “a master of terrorism.” But I found out that a ’48 Magazine indeed existed – in fact, it was apparently a relatively expensive highbrow magazine – and the author of the article, David W.Nussbaum, wrote at least two (but likely four) other articles on the mufti elsewhere in the immediate postwar years. 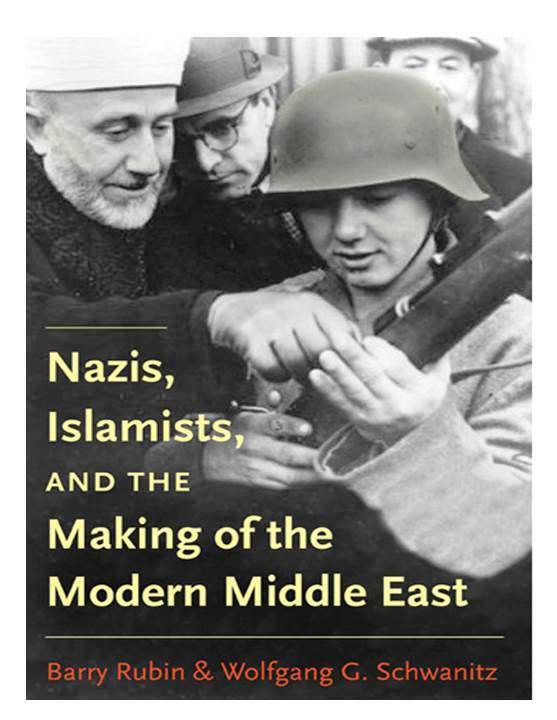 According to the information given about Nussbaum, he was a “former Washington correspondent of Life, magazine writer and Navy air veteran” who in early 1948 had “just returned from an extended survey of conditions in the Middle East.” His article on the “Hitler of the Holy Land” is absolutely fascinating (it can also be downloaded as a pdf if you click the blue button “Read article for free” just above the space for comments). A version of this post was first published last Dezember at EoZ. Among the sites cited by Palumbo-Liu was one I was not familiar with, but when I checked it, I immediately noticed an article promoting antisemitic conspiracy theories, and it quickly turned out that the site features several writers specializing in this field. Shockingly, Palumbo-Liu – who claims to take antisemitism very seriously – has allowed this site to cross-post his Huffington Post column [archived here], which I noticed only now when I saw that he is promoting the cross-post on Twitter. 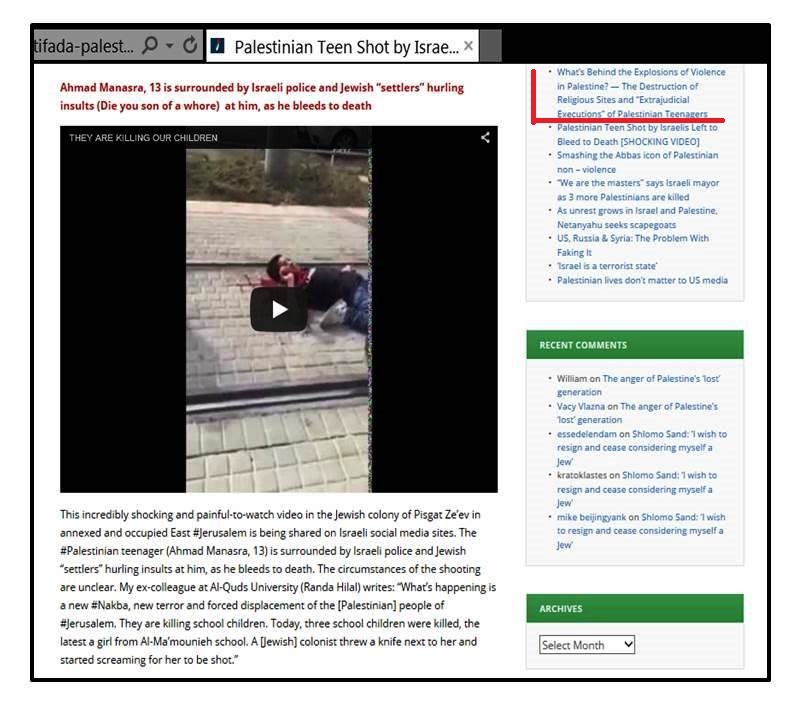 From Palumbo-Liu’s article on the site, you could also continue on to another post featured among the recent entries in the sidebar, which promotes a video entitled “They are killing our children.” This post is an excellent example of the 21st century version of the medieval blood libel. The 13-year old Palestinian “killed” in this video had just stabbed and critically injured a 13-year old Israeli Jewish boy; in the meantime, the young terrorist was released from hospital into police custody, while his victim remains hospitalized due to the serious injuries he suffered. 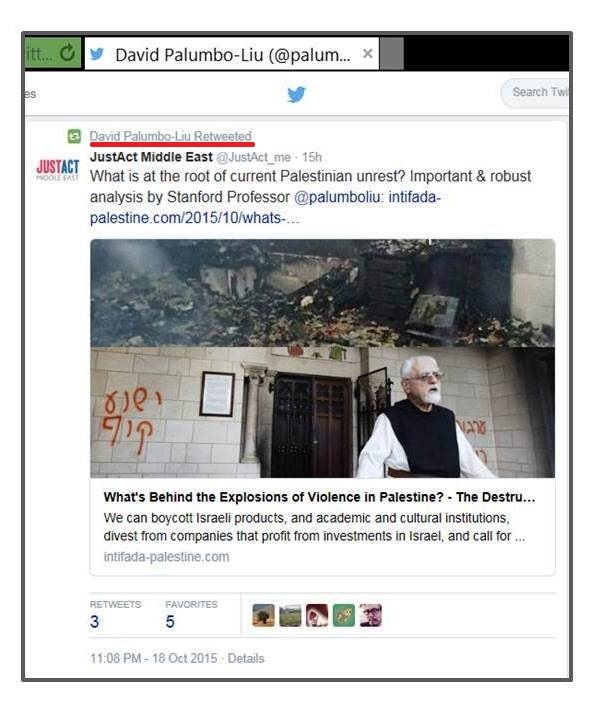 Quite the contrary: as documented here, Palumbo-Liu actually lends his prestige as a Stanford professor to sites and causes that promote antisemitism. As far as the Palestinians are concerned, the recent visit of Pope Francis to the Holy Land was a visit to “Palestine” that provided just another opportunity to present Israel’s creation as a “catastrophe” or “nakba” for Palestinians in general, and Palestinian Christians in particular. Moreover, Yemini rightly argues that the Palestinian “nakba” should be seen in similar terms as the German “nakba:” after Germany lost its war of aggression, “[b]etween 12 and 16 million ethnic Germans were expelled from central European states at the end of the war and in its aftermath. Between 600,000 and two million were killed during those expulsions, which included innumerable pogroms and massacres.” The Palestinians – many of whom viewed the Nazi ally Haj Amin al-Husseini as their leader (as also the previously cited eye witness report from Jaffa in 1947/48 confirms) – were likewise on the losing side of a war of aggression that had been instigated by several Arab states. Moreover, there is no reason to think that “Hitler’s mufti” had given up on his plans for a “final solution” of his “Jewish problem” – plans he had developed in the comfort and luxury provided by the Nazi leadership since he became their guest in late 1941. And it is also relevant in this context that some 30 000 of those Jews whom the followers of al-Husseini despised as “cowards” had volunteered to fight the Nazis by joining the British army. 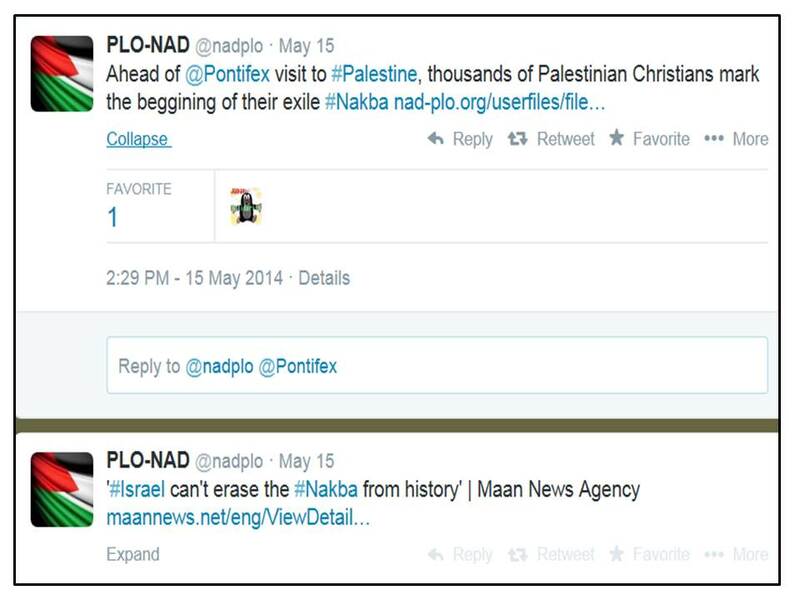 Needless to say, so-called “pro-Palestinian” activists are incensed when they are confronted with even the slightest hint that their nakba “narrative” may ignore some inconvenient historical facts. 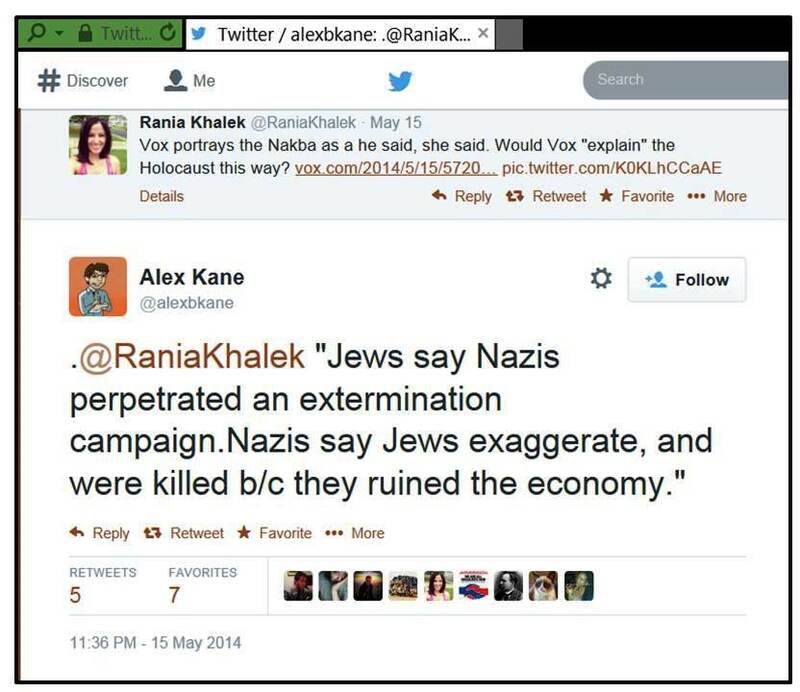 As this exchange (h/t Nurit Baytch) between Rania Khalek and Alex Kane illustrates, they regard any questioning of the Palestinian view that the “nakba” was a “catastrophe” inflicted by evil Zionists on completely innocent and peaceful Palestinian civilians as comparable to minimizing the Holocaust with the argument that the Nazis felt the Jews were ruining Germany’s economy. One more reason to conclude it is justified to cite Khalek as an example for the bigotry that is so pervasive in the BDS movement; and, given the fact that Kane serves as “Assistant Editor” at Mondoweiss, one more reason to conclude that this site is indeed deeply tainted by antisemitism. Since I wrote a few weeks ago about the publication of a vicious anti-Israel screed authored by Max Blumenthal, there have been some noteworthy new developments. As I noted back then, Blumenthal’s rant was endorsed not only by influential writers and supposedly respectable academics, but also by activists associated with sites like Mondoweiss and the Electronic Intifada that devote themselves single-mindedly to maligning the Jewish state. It was therefore hardly surprising when it turned out that these supposedly “progressive” Israel-haters cheered a book that also got much praise from notorious Jew-haters posting at various far-right fringe outlets, including David Duke’s website. 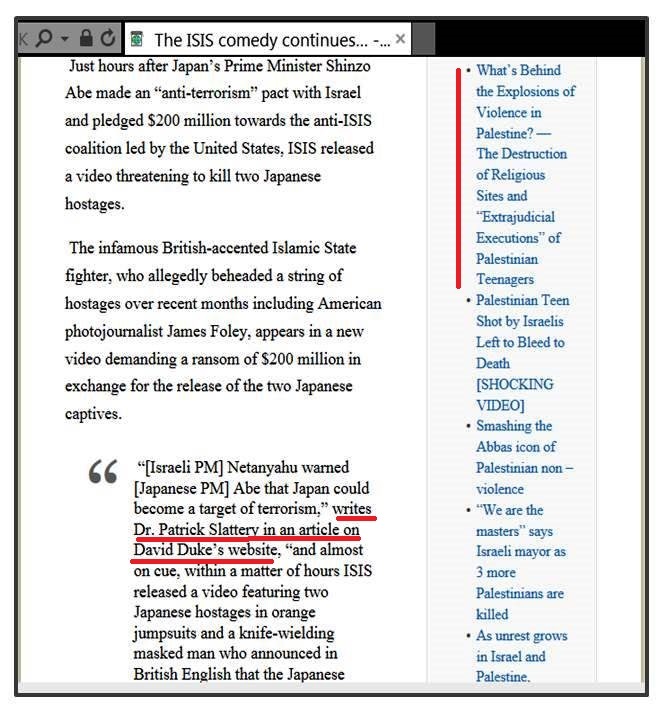 Among the entirely expected results of the NAF event was that mainstream publications like Foreign Policy started to cheer Blumenthal’s smug dismissal of his critics as hate-filled right-wingers full of “hot air,” while The Atlantic seemed to suggest that opposing the promotion of Blumenthal’s David-Duke-endorsed views was tantamount to opposing free speech. Soon enough, popular blogger Andrew Sullivan chimed in with a post entitled “Not So Mad Max,” which he followed up a few days later with another post that asked “Who’s Afraid Of The Truth?” Both Sullivan and the Atlantic’s James Fallows chose to imbed into their posts a video co-produced by Max Blumenthal and posted on YouTube under the title “Israel’s New Racism: The Persecution of African Migrants in the Holy Land.” The clip has already more than half a million views. One might add that the footage shows not only grown men behaving like sadistic savages, but also lots of children excitedly watching the gruesome spectacle and cheering it on. If we want to deal with this topic à la Max Blumenthal, we will have to end this chapter by insinuating that the fate of disabled Palestinians is similar to how the disabled fared in Nazi Germany. 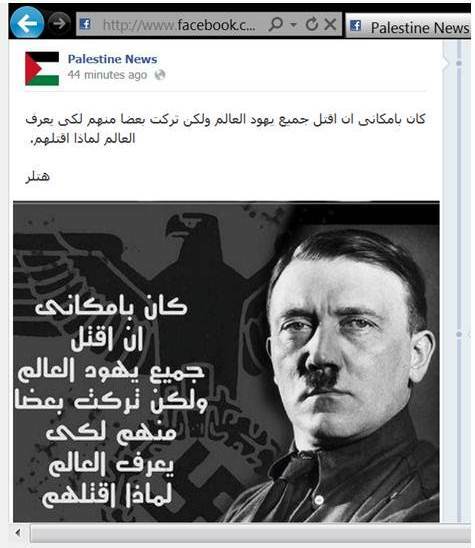 The next chapter could perhaps deal with the praise repeatedly heaped by Mahmoud Abbas on Haj Amin al-Husseini, the Palestinian leader who is also known as “Hitler’s Mufti” because he collaborated with the Nazis; here, Blumenthal’s chapter title “The Days of ’48 Have Come Again” could become “The Days of ’43 Have Never Gone”. 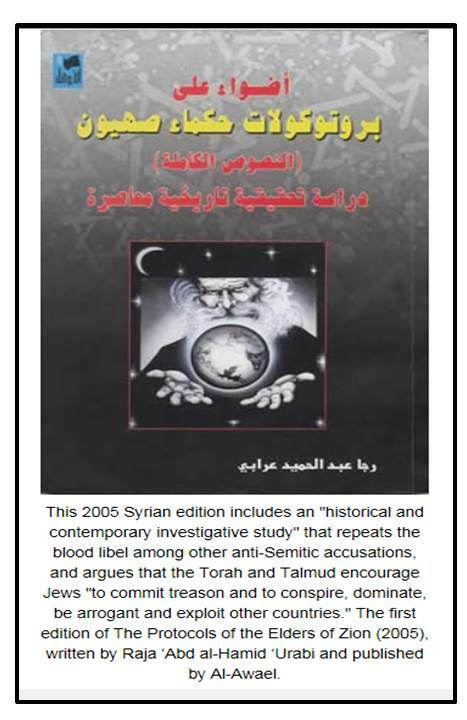 Then we could move on to the enormous popularity Osama bin Laden enjoyed among Palestinians for the decade after 9/11 – maybe Blumenthal’s chapter title on “The Joint Struggle” could come in handy here. 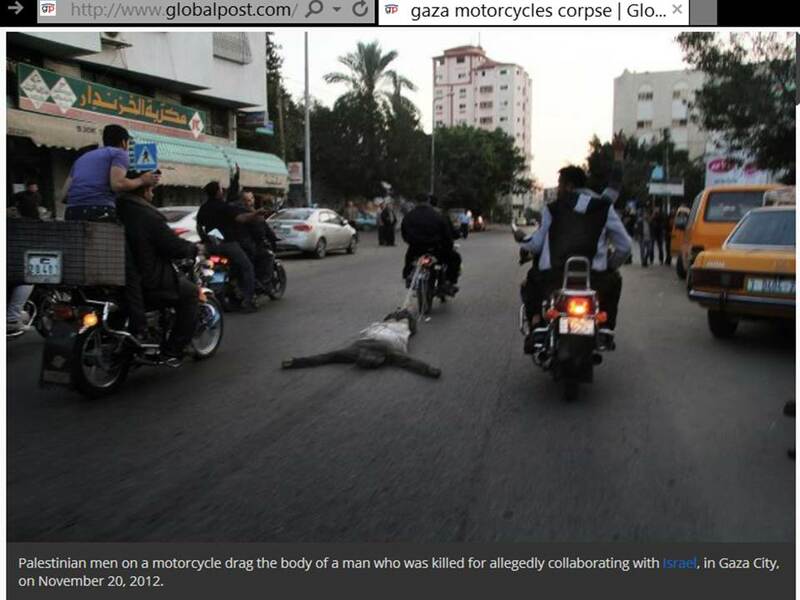 Staying with our Blumenthal-inspired topic of “Islamofascism,” we might then highlight the rather dramatic results of a recent Pew study documenting massive popular support for reactionary Muslim views among Palestinians; the obvious topic to continue would be the recently reported “worrisome trend in rise of ‘honor killings’” perpetrated by Palestinians. Naturally, the appalling prevalence of corruption and its corrosive effects on Palestinian society would also have to be addressed; likewise, it would be inexcusable to ignore the heartbreaking cruelty inflicted on poverty-stricken and ill Palestinians who have to watch helplessly as their modest dwellings are demolished by a merciless Hamas-government. So there is obviously more than enough material to come up with a 500-page Blumenthal-style screed. 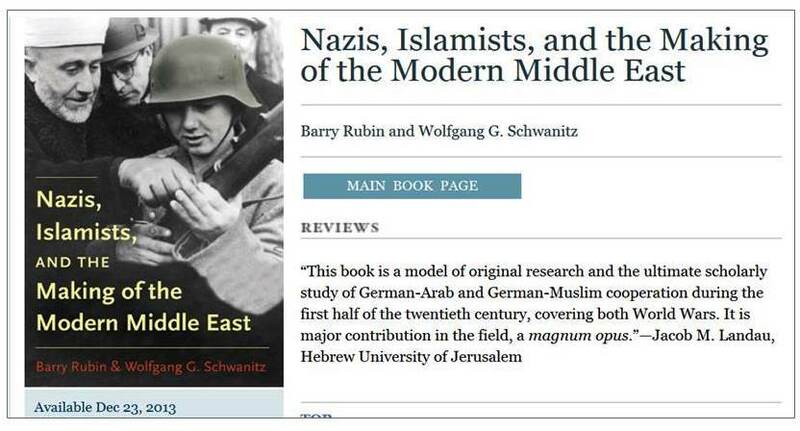 But what are the chances that such a book – faithfully reflecting Blumenthal’s modus operandi with its relentless focus on portraying Palestinians only in the worst possible light – would be promoted by the NAF? What are the chances that Andrew Sullivan would insist that “Life and Loathing in Palestine” should be taken seriously and deserved to be reviewed in the New York Times? 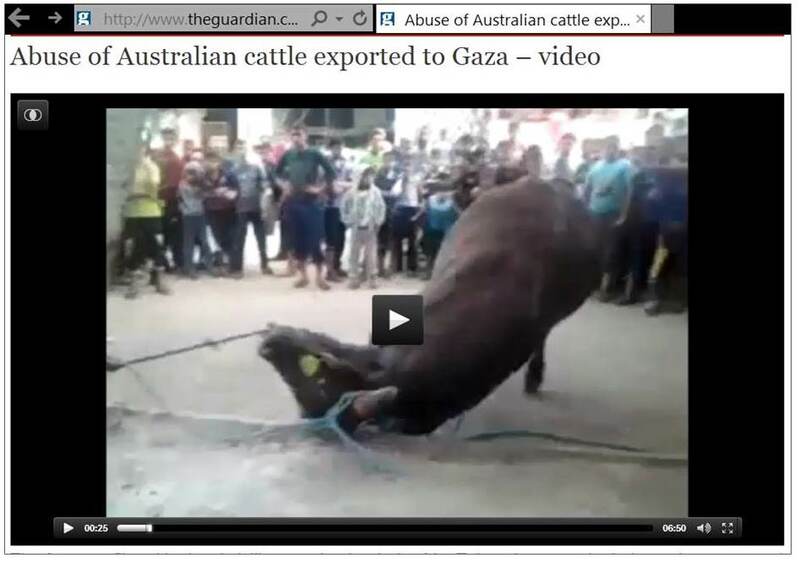 What are the chances that Blumenthal’s defenders would eagerly link to the appalling video clip from Gaza, insinuating that it provides a good illustration of how terrible Palestinians truly are? As we all know, the chances are nil – because the rules that apply when it comes to demonizing the world’s only Jewish state are of course totally unacceptable when others are concerned. Naturally, a desire to have noise nuisance laws enforced and opposition to the spread of radical Islamists amounts to “ethnic cleansing” – at least in the whacky world of Ali Abunimah’s Electronic Intifada. One could perhaps wonder how Jaffa’s Christian residents feel about the noise from mosque loudspeakers and Islamists – but if you want to advance the ridiculous claim that the silencing of mosque loudspeakers and opposition to Islamists amount to “ethnic cleansing,” it is clearly better not to dwell on the inconvenient fact that there are Arab Christians in Jaffa and that it is a town with several impressive historic sites associated with Christianity. Indeed, speaking about inconvenient facts, Abunimah manages to demonstrate in this post that he is a master of ignoring them. Understandably, Abu-Lughod, a professor of political science, didn’t mention the fact that the man who headed the popular “traditional Palestinian leadership” in the second half of the 1940s had spent the first half of the decade in Berlin, where he lived in considerable comfort as a well-paid guest and committed ally of Nazi Germany. “I worked in a branch of the committee based in the headquarters of the Muslim Youth Association near the port of Jaffa. Our job consisted mainly of harassing people to dissuade them from leaving, and when they insisted, we would begin bargaining over what they should pay, according to how much luggage they were carrying with them and how many members of the family there were. At first we set the taxes high. Then as the situation deteriorated, we reduced the rates, especially when our friends and relatives began to be among those leaving. Abu-Lughod himself stayed in Jaffa until May 3, when he left by ship together with two friends to make the short trip to Beirut. By July 1948, he was already back with his family in Nablus, from where he soon made his way to the US to study and to build a successful career at Northwestern University. He left there in 1992 to become vice-president of Bir Zeit University in Ramallah. So who knows: maybe UNRWA would be willing to expand its definition of Palestinian refugees to those who would leave Jaffa because they are deprived of being woken up at dawn by blaring mosque loudspeakers or because they feel that it’s really unfair when Osama bin Laden fans are regarded as extremists. As much as the media like to report and opine on Israel, they usually do so in a way that presents Arab and Muslim hatred for the Jewish state as an ultimately understandable reaction to Israeli policies. The intense hatred for Jews that is so prevalent throughout the region is a topic that is rarely broached, leaving western audiences oblivious to the fact that in today’s Middle East, antisemitism is as acceptable – and perhaps even more popular – as it was in Nazi Germany. 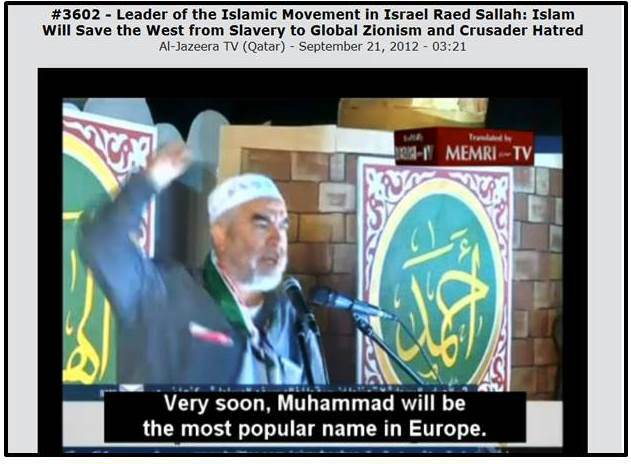 However, it seems that the usual reluctance to report on Arab and Muslim Jew-hatred was deemed untenable when MEMRI recently posted some video clips from 2010 that showed Egypt’s current president Morsi delivering antisemitic rants. But while this story has by now been widely covered, initially nobody was really eager to report it – as Jeffrey Goldberg highlighted when he entitled a related blog post “Egyptian President Calls Jews ‘Sons of Apes and Pigs’; World Yawns.” Goldberg also linked to a fascinating Forbes story by Richard Behar, who actually took the trouble to monitor how Morsi’s remarks were (not) covered in most of the western media for several days. While I don’t share Behar’s optimism, I sure wish he was right, because this would certainly be a most welcome development that would enable many people around the world to have a much better understanding of the Middle East and the reasons for the lack of peace between Arabs and Israel. “Morsi’s anti-Semitic views are not surprising in themselves; indeed they are completely mainstream and unobjectionable in the Egyptian context. Not many people in Egypt would disagree with the statements in question, and Morsi is more likely to be attacked for being too soft on Israel than for venting his spleen. But these statements, and the widespread support for them, should remind everyone just how slim the chances are for real peace between Israel and its neighbors. There are a lot of illusions out there about how the exercise of power will moderate the Muslim Brotherhood and similar groups. To some degree, Morsi’s record in office shows a pragmatic willingness to maintain a treaty he deeply loathes with the ‘sons of apes and pigs.’ But we would do better to think of this as caution rather than moderation. If a real opportunity presented itself to destroy the Jewish state, there can be little doubt that Morsi and the members of his movement would think it their duty to act. Since I asserted above that in today’s Middle East, antisemitism is as acceptable – and perhaps even more popular – as it was in Nazi Germany, let me close with two recent examples that illustrate this point. However, a spokesman for Abbas later denied that Abbas had talked about a link between Zionism and Nazism, and the remark about the “70 more books” certainly seems bizarre. “I have argued for some years that an assault on Jewish life always needs justification by the highest source of authority in the culture at any given age. Throughout the Middle Ages the highest authority in Europe was the Church. Hence anti-Semitism took the form of Christian anti-Judaism. In the post-enlightenment Europe of the 19th century the highest authority was no longer the Church. Instead it was science. Thus was born racial anti-Semitism, based on two disciplines regarded as science in their day: the “scientific study of race” and the Social Darwinism of Herbert Spencer and Ernst Haeckel. Today we know that both of these were pseudo-sciences, but in their day they were endorsed by some of the leading figures of the age. The observations offered by Sacks here are all the more important because nowadays, we tend to think of racism and bigotry as somehow “primitive” resentments that are fed by ignorance and a lack of education. But Sacks is obviously right to point out that historically, antisemitism was justified by the elites – first the Church, and then by “science.” Indeed, it was the effort to introduce a pseudo-scientific racial component into the debates about Jews in Germany that motivated the German agitator Wilhelm Marr to use the term “antisemitism” instead of Jew-hatred. Obviously, the assertion that contemporary antisemitism has found a new source of moral authority by utilizing the language of human rights will be denounced most loudly by those who view Israel as a serial perpetrator of monstrous human rights violations that fully justify singling out the Jewish state at the UN and in political campaigns. It was of course exactly this kind of militant NGO activism – with the Jewish state as its preferred target – that prompted Robert Bernstein, the founder and long-time chairman of Human Rights Watch, to “publicly join the group’s critics” and denounce its obsessive focus on Israel. Eventually, Bernstein decided that it was best to start all over again, and he founded a new organization named Advancing Human Rights. Yet another revealing feature of the “human right-ism” of recent years is that since Israel is its favorite target, antisemitism is usually either ignored or even excused as understandable “anti-Zionism” or entirely justified “criticism” of Israeli policies. 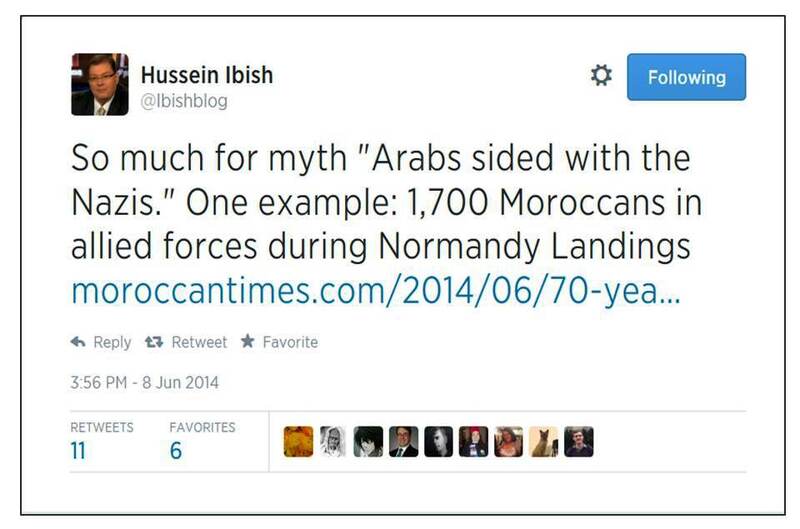 Needless to say, such views have been eagerly embraced by Arab and Muslim regimes. In this context it is also important to see that the observations of Chief Rabbi Lord Sacks about Europe’s Jew-hatred are equally valid for the Muslim world. Just like the medieval church legitimized Christian anti-Judaism, Muslim religious texts, including the Koran, provide plenty of “justifications” for Jew-hatred, and Jewish communities under Muslim rule experienced not only the indignities associated with their subordination as “dhimmi”, but also outbreaks of violence and communal persecution. Yet, Qaradawi is widely regarded – and indeed admired – as the “Global Mufti.” The fact that this “Global Mufti” of our times is an avowed Jew-hater who is a fervent believer in a divinely ordained battle between “all Muslims and all Jews” is clearly of no concern to the champions of “human right-ism” who would eagerly mobilize to denounce any Christian or Jewish leader espousing views even remotely comparable to the ones Qaradawi has long been preaching. 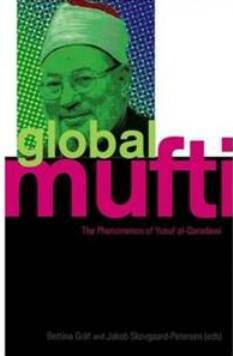 The Global Mufti: The Phenomenon of Yusuf Al-Qaradawi. Bettina Graf, Jakob Skovgaard-Petersen, C Hurst & Co Publishers Ltd (20 July 2009).